It’s the first full week of the New Year, which means 150,000 delagates have converged on Las Vegas for the annual Consumer Electronics Show (CES). Today is the last day for more than 3,500 exhibitors to impress attendees that their product is the “next great thing.” Last month we featured an app developed by NantHealth running on a BlackBerry smartphone to browse a patient’s cancer genome, reporting it would be launched at CES. This week NantHealth showed off a small device called the HBox that will monitor a patient’s vital signs and, via BlackBerry Messenger (BBM), send data to the doctor. Another device that has garnered attention is the GoBe (seen at right) that claims to track automatically the calories that someone consumes. Referred to as the Holy Grail, it is intended for users who want to lose weight but lack the patience to record their food intake. 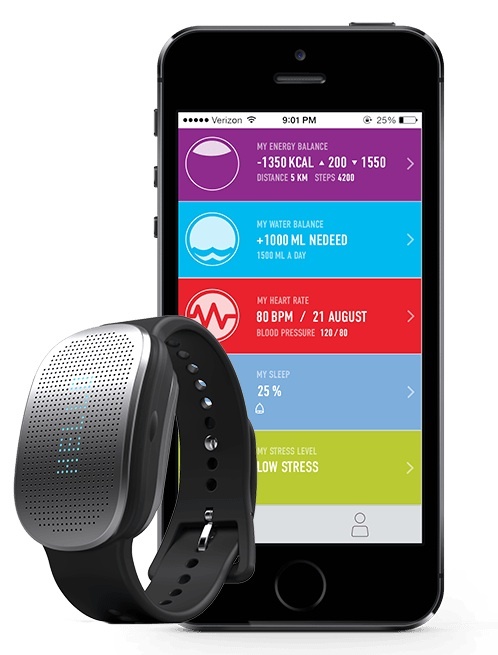 Worn on the wrist, the Gobe’s sensor uses bioimpedance, and a sophisticated algorithm, to estimate calorie count. BBC News were skeptical and challenged the firm’s co-founder George Mikaberydze to a test, feeding him a cheese and turkey sandwich, a bottle of apple juice and a chocolate bar (total calories = 555). After 2.5 hours, allowing George’s body to digest the food, the GoBe generated its result: 514 calories, which was reassuring. Perhaps one of the most exciting products to have its debut at the CES was a smart hearing aid unveiled by Siemens. When two hearing aids are worn – one behind each ear – they communicate wirelessly with one another, focusing on the desired speech with pinpoint accuracy, which is ideal for noisy restaurants and cocktail parties. The hearing aids also communicate with smart phones for further customisation. Hocoma is a Swiss-based company that demonstrated its Valedo product: two lightweight sensors that are attached on the upper chest and lower back, where the intent is to reduce or prevent lower back pain. Each sensor incorporates an accelerometer, gyrometer and magnetometer to track 3D movements, while the app runs the user through a series of exercises and also tracks improvements. Blue Spark released its smart thermometer, a soft patch that is attached to the skin – e.g. under a baby’s armpit – and connects to an Apple or Android phone via Bluetooth (seen at left). 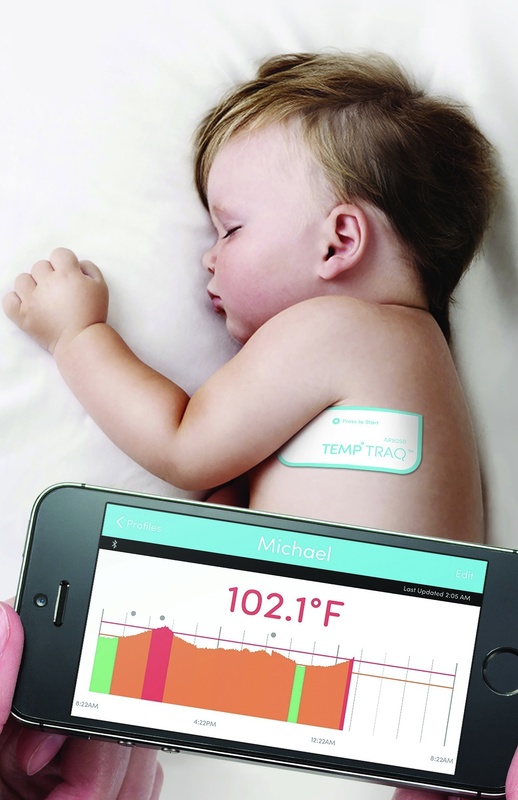 TempTraq monitors the temperature continuously, without the need to wake the baby, and the app can alert the parent if the value reaches a dangerous level. Undoubtedly, wearables have come of age!